Muscle Cramps on a Zero Carb Diet | Eat Meat. Drink Water. Muscle cramps, especially in the legs, are a common experience for many when they first adopt a Zero Carb diet. It is one of the many unpleasant symptoms that can occur during the adaptation period, but sometimes they can continue for longer. There are a number of reasons that these muscle cramps occur, but the main one is an electrolyte imbalance. When you first go on a low-to-no carb diet, you lose a lot of excess fluid from your cells. As this fluid gets flushed out from your body, it carries electrolytes with it. There are four main electrolytes: sodium, potassium, magnesium, and chloride. Many folks who experience muscle cramps when they first begin a Zero Carb diet have found that both extra salt (containing both sodium and chloride) and extra magnesium can help to prevent muscle cramps during the transition process. However, increasing these three electrolytes is not universally helpful, and it is my opinion that potassium is often the electrolyte that most needs to be supplemented. The RDA for potassium is about 5,000 mg per day. It takes about 3 lbs of fresh meat to meet this requirement. Whether the RDAs are the same for people following an all meat diet is certainly open to debate, but I offer it here for reference. However, whether 5,000 per day is necessary for long term health on a Zero Carb diet or not, it is highly likely that the amount of potassium being excreted during the transition and adaptation period is excessive enough to tip the balance in the wrong direction and cause muscle cramping. Traditionally, even the most knowledgeable Low Carb doctors have recommended consuming additional salt and magnesium during the early stage of a person’s transitions to such a diet. And Dr. Phinney explains that without adequate sodium, the muscles cannot retain adequate potassium inside the cells. (To read more about this, please see my article on Salt.) However, it baffles me that he never once recommends including extra potassium. I suspect that the reason for this oversight by Dr. Phinnney may be that he is promoting a Low Carb diet that still includes low carbohydrate plant foods, like leafy greens and berries. All fruits and vegetables are rich in potassium. But, on Zero Carb, our only source of potassium is from the meat we are eating, and while some folks can consume 3 pounds of meat a day, many others cannot. Consequently, it is my opinion, that if a person new to the Zero Carb diet is experiencing muscle cramps, they would be wise to consider supplementing with extra potassium, in addition to the other three electrolytes. Unfortunately, potassium is a mineral that the FDA has very strict regulations on, and all supplements must not exceed 99 mg per dose. This makes is difficult to obtain adequate supplementation through a capsule or tablet and is more expensive than it really needs to be. The restrictions on potassium were put in place because too much potassium can lead to hyperkalemia (high potassium) which is very dangerous. But the amount of potassium that one needs to ingest to reach toxic levels is quite high. Dr. Max Gerson, a highly respected German-born physician who treated cancer, prescribed a diet that included about 10,000 mg of potassium each and every day, both from food and supplements, without any negative consequences. The only time that normal moderate potassium supplementation can be dangerous is in people with severely compromised kidney function and out-right kidney failure. A natural way to increase potassium on a Zero Carb diet is through meaty bone broth. (Please see my earlier article on this subject: Can Bone Broth Be Used as Part of a Zero Carb Diet?) Broth from just bones without meat on them will not contain much potassium, but broth that has been prepared from meaty bones or meat alone will. This is because the potassium is in the meat and not the bones. If a person is unable to consume bone broth due to glutamine sensitivity, then broth made from just meat, like lean round or rump roast, will serve equally well for this purpose. You can buy whole round roasts at Costco for less than $4.00/lb. Every pound of beef contained 1,200 mg of potassium which will get transferred to the water it is cooked in. I also like to use turkey parts, such as backs, necks, wings, and drums because they are a nice combination of both meat and bone and fairly affordable. Whole chicken works equally well. I always toss the meat and bones after cooking because all of the nutrients have been cooked out of them. If making meat or meaty bone broth is not a task you wish to undertake, you can add a little extra potassium to your regimen through a supplement. The best product for the price is Potassium Gluconate Powder by NOW Foods which provides 270 mg of potassium per 1/2 tsp. For some reason, this particular product is not being held to the strict FDA limitation of 99 mg per serving that every other potassium containing supplement on the market. It is pretty affordable at $18.00 for an 16 oz. bottle that provides over 250 servings. Long term Zero Carb-ers like Michael Frieze had to go through the adaptation period on therir own with little support from others or knowledge of what to expect. Many of these individuals experienced muscle cramps for the first few months after beginning the diet, but the cramps gradually became less frequent and disappeared altogether. Michael – taking the advice of Owlsey Stanley, a.k.a. The Bear – decided to remove salt from his diet completely at the same time he began a Zero Carb diet. His body eventually adapted to a salt-free, all-meat diet, and he has had no issues with inadequate electrolytes or any other deficiencies for the past 5 years. So, the worst case scenario if you do nothing, is that you might have muscle cramps for a few months while your body is adapting. But, meaty bone broth and/or a good electrolyte formula like the one mentioned above will likely make your transition easier. While I think an electrolyte imbalance is the primary cause of muscle cramping in the early stages of adopting a Zero Carb diet, another possible cause is inadequate water intake. 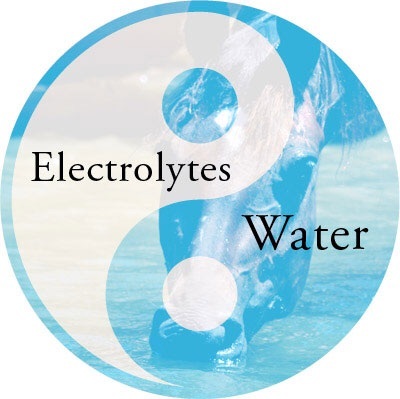 Sufficient water is needed for the electrolytes to do what they need to do. There is some difference of opinion in the Zero Carb community about how much water a person should drink. The advice most often given is to drink according to thirst, but I am not convinced that thirst is our best indicator of when we need water. I base my opinion both on my own experience and the works of Dr. Fereydoon Batmanghelidj. Dr. B was an Iranian-born physician who found that many different illnesses went away in his patients when they simply started drinking more water. According to Dr. B., water is the single best natural anti-histamine that we have at our disposal, and this is one of the primary reasons that drinking an adequate amount can have such a positive impact on so many different health problems. He wrote several very interesting books which I have read and highly recommend: Your Body’s Many Cries For Water; You’re Not Sick, You’re Thirsty; and Water Cures, Drugs Kill: How Water Cured Incurable Diseases. He has written several other books that I have not yet read, but which might also be worthwhile. You will find them all through Amazon by searching on his name. I have helped two personal friends of mine to virtually eliminate their seasonal pollen allergies and lifelong asthma by getting them to follow Dr. B’s protocol. Both of my friends were coffee drinkers and neither of them liked to drink water. Coffee is dehydrating, so drinking it in place of water can compound the problem. Dr. B says that it takes about 2 months for the cells of your body to become fully hydrated once you begin his protocol, so results may not be immediate. By the time allergy season rolled around, however, both of my friends had been drinking more water for a few months and the results were quite stunning. Their allergies were basically non-existent, and the one with lifelong asthma only needed to use his inhaler about 3 more times and never got his prescription refilled. Some people have a lot of resistance to increasing their water consumption because they don’t like the way plain water tastes. I think this is due mostly to the poor quality water most of us have access to today. I have tasted water coming out of natural mountain springs and it is nothing like what comes out of our kitchen tap or the filtered bottled waters sold in stores. Buying really good bottled natural spring water like Fiji is prohibitively expensive for most people. But it is important to take the time to find a water that is both pleasant tasting and affordable, or get a filtration system that will turn your tap water into something drinkable. Nora Gedgaudas recommends the Berkey water filtration system, for both its effectiveness and its price. I have tasted the water produced by a Berkey and it is excellent in my opinion. We often forget the basic needs of the human body, seeking answers in more complicated and esoteric directions. Adequate water is extremely important to the proper functioning of our bodies. In the late 1800s, Dr. James Salisbury and his protege Mrs. Elma Stuart healed many people of many different illnesses simply by prescribing a diet of beef and water. They considered the water to be just as important as the beef, and their protocol is surprisingly similar to that of Dr. B. Like Dr. B., Dr. Salisbury and Mrs. Stuart recommended that a minimum of 2 liters of plain water be consumed throughout the day. Many people of their time reported greatly improved health simply by following the water protocol alone, without even changing their diet. It seems that the vital importance of water for human health must continually be rediscovered in each generation. You can read more about the beef and water diet they recommended in Stuart’s wonderful volume What Must I Do to Get Well ? So, the importance of water and the role is plays in supporting the health of our beautiful bodies should not – in my opinion – be underestimated. Increasing your water consumption is a very simple thing to do and is a great place to start if you are experiencing any type of chronic health problem, be it muscle cramps or something more serious. If you are drinking less than 2 liters of water per day, and you are struggling with an all meat diet, I think it is worth considering a 30 to 60 day trial of increased water consumption to see if it makes a positive difference in the way you feel. This entry was posted in Esmée La Fleur and tagged Balance, Batmanghelidj, Chloride, Deficiencies, Electrolytes, Health, Low Carb, Magnesium, Minerals, Muscle Cramps, Nutrients, Potassium, Sodium, Water, Zero Carb by esmeelafleur. Bookmark the permalink. Thanks, Esmee, for sharing your thoughts, opinions, and findings with us! Most of us just don’t the time to put in all the research that you do. “Sufficient water is needed for the electrolytes to do what they need to do” — sufficient, no doubt, but there’s also the pro-“listen-to-thirst” argument often suggested that too much fluid intake somehow dilutes electrolytes and/or leeches minerals, leading to a deficiency that otherwise wouldn’t be there. Something to keep in mind or further discuss I guess? Hi Phil, neither too much nor too little is good for you. My concern is for people who are not feeling well and who, therefore, may not be drinking enough. I know people who only consume 16 oz of plain water a day and who are experiencing some unwanted health issues or who are not experiencing the benefits they would like from a Zero Carb diet. If a person feels well, then there is likely no need to change anything. Thanks again for sharing your discoveries! I have a question about salt. For my five months of Zero Carb, I have been adding salt in order to help with histamine intolerance. Now I am wondering if salt continues to be beneficial for histamine intolerance over the long term, or whether it is only short-term. I’ve found that Morton’s Lite Salt is a convenient, cheap and palatable potassium supplement. A mixture of salt and potassium chloride, it contains 350 mg of potassium and 290 mg of sodium per 1/4 teaspoon. Could electrolyte deficiency be a cause for shortness of breath? Whenever I try to eat high fat, I have shortness of breath and heart palpitations and cold hands and feet; it’s really annoying and it makes me worry that maybe the fat is not good for me. But at the same time, when I try the high fat diet, I usually drink more coffee, which I now know may cause more of an imbalance. I actually feel better eating complex carbs and less fat; I don’t get hungry for a long time when I eat both complex carbs/protein, but I wish I could achieve the results of these people. All kinds of symptoms are possible during adaptation. My gut instinct is telling me to stop coffee for this very reason. What do you suggest? Seems I have quite a bit of adjustments to make while becoming ketogenic. I personally do not do well with coffee. It is a plant food and is contains caffeine which is addictive. It is a very recent addition to the human diet. Thanks for the article. I have started and stopped ZC many times over the last few months. Mostly due to horrific foot/leg cramps. Starting up again. Hoping some supplementation helps! Please keep me posted and let me know if it helps. Hello Esmée, I wonder if your are still drinking 2 litres of water each day and if you are still adding salt in it. If so how many tsp? Thanks! Yes, I still drink about 2 liters of water per day. I am currently doing a no salt experiment. I have been salt-free for exactly one month, so it is still too soon to say much. I plan to give it a few more months and see how I do. Hi Esmee, Nigel here. Back on the wagon, and pink salt plus Ionic Magnesium has made ALL the difference. Cramps gone, hitting personal records on the bike, feeling great. Thanks to Nora Gedgaudas’ Ionic recommendation I feel super powered! Keep up the good work babe. Much love! Thanks for your helpful article, you have given me some tips to combat the cramping I am experiencing on a new low carb diet. You indicate coffee is dehydrating. Isn’t it more accurate to say that caffeinated drinks are not as hydrating as non-caffeinated drinks, but are still a net positive? Esmee- You recommend Potassium Gluconate. In your opinion, how does this differ from Potassium Chloride, like found in salt-substitutes and some vitamin-suppliments? -Thanks! It really depends on you. The chloride version is suposed to be less absorbable. The citrate version is supposed to be the most absorbable. But the citrate version makes me feel terrible – full body pain – no idea why. I haven’t tried gluconate myself, but it seems to be the most compatible for the most people. I don’t take any potassium supplements or salt at this point because they all gave me migraines. I have been off all of them for over a year now. Thank-you! Out of curiosity, are you still making/drinking the bone broth for its potassium-gluconate? No, i get enough potassium in the meat itself. It was very helpful during adaptation though when my body was losing excess water (with electrolytes in it). Now, I don’t need it. Thanks for the awesome website Esmee. I have been doing a slow transition to LCHF to begin with and feeling best (to say the least) with fatty cuts of beef. My long term depression and anxiety has cleared up to a great extent and my sleep quality has improved, as has my energy among many other things. I spent about 4 weeks reading through this site recently and it helped so much to know what to expect. I have begun to develop a light, red / spotty, itchy rash on my shins and legs. I am guessing it is what some people call keto-rash and a normal symptom of adapting to fat burning. At first I was afraid I would have to stop the diet for forfeit all the health benefits I have experienced so far, but if I do not scratch, it is very mild and barely noticeable. I am now thinking that some extra potassium would help, but 5 grams per day seems like an insane amount to consume if seeking whole food sources. Anyway, I trust it will pass on it’s own, given time. Drinking extra water does seem to help. If you scroll down the page of the link you provided, it lists the contents as actually 175 mg and recommends not consuming more than 4 servings per day, which would limit effectiveness to a total extra 700 mg potassium per day. Do you think that the RDI is perhaps over-estimated for low carb / zero carb diets in a similar manner to that of the calcium RDI? Thank you for the correction. I think that the sodium-potassium balance is more important than absolute amounts of potassium. The very successful long term zero carbers I know live exclusively on fatty beef (ribeye preferably), eat no salt, and take no supplements. You always want to consume more potassium than sodium. Beef is naturally 4:1 potassium to sodium. Every pound of beef has about 1200 mg of potassium. The long term zero carbers I onow eat about 2 lbs a day and have never had any problems. However, it does take time for the body to adapt. When I stopped sakt completely myself a year ago, it took a full month to adapt. I was extremely dry (mouth, lips, eyes), had tachycardia, low blood pressure, fatigue, etc. Then, over night everything normalized. No worries. I am currently eating 500 g (1.1 pounds) of scotch fillets (rib eyes) with a few mushrooms for dinner. I have worked up from one steak and gradually reduced vegetables. I currently feel very satiated from those 2 x 250 g steaks. I am 6 ft, 70 kg (154 pounds) male. Breakfast has changed from oats with fruit to 4 large eggs and 2 large sausages, but I feel I could do without the sausages given the processing and random added ingredients. I do not eat lunch or any snacks. I do love my salt and am usually very generous with it. I have noticed far less desire to add any vitamin / fish oil supplements. Thanks for the info. I will be more sparing with my salt use in future. I was heading in the other direction, which supposedly (according to Phinney) helps to spare some potassium being given up (internally by the kidneys and so on?). But yes, it would seem like the natural way to keep the ratio is not to mess with it by adding too much salt, if any at all. Great that you pushed through for a month and were able to normalise without salt. Do you think it would be possible to reduce those adaptive symptoms by gradually tapering down rather than doing a hard cut, or did you already taper your usage first? Yes, a gradual consistent taper would likely make the transition easier. Phinney promotes a low carb diet which includes plant foods and, therefore, provides more potassium than a zero carb diet. I have very much enjoyed reading your blog about muscle cramps. I have been on a low carb/zero carb diet for almost 3 weeks now. When I first started I just ate meat and a few leafy greens such as lettuce, cucumber and broccoli. I suffered from leg cramps and muscle twitching for the first few nights but this soon disappeared. Three days ago I changed to Zero Carbs and the leg cramps and twitching are back with a vengeance (hence typing this at nearly one o’clock in the morning). I already drink around 7-8 pints of water a day so I think that’s probably not the problem. I may need to change the meat I’m eating from pork to beef to get more magnesium. The only salt I use is the Himalayan pink salt which I freshly grind. Do you have any tips for me as I really want to give the diet a good try and not give in so soon after starting. Oh, by the way, I am also swimming around 1000m, 3-4 times a week. You don’t need to do anything. It’s part of adaptation to no carbs. However, more potassium woukd likely help you through the transition. The best way to increase potassium naturally is through broth made from whole chicken or turkey parts. You coukd also use a “low salt” product whichbis half sodium half potassium. There is a one made from a Himalayan salt company that I’ve seen in Whole Foods. Having done lots more reading I have tried having a magnesium supplement and have had a good night’s sleep (Thank goodness). Despite a terrible bout of diarrhea the other day I seem to adapting better now. I am determined to carry on as my arthritis symptoms have been so much better since starting the new way of eating. I am just ending week 3 of zero carb and I am finding that maybe my electrolytes are still wonky. I have always been pretty sensitive to heat/sun and can usually only be out in the heat for about 4 hours before I start getting nausea, dizziness, and eventually throwing up. Today I was out in the heat for about an hour and a quarter and it was already hitting me. I have been taking potassium and magnesium every night (capsules 250 mg and 50 mg respectively) to get rid of muscle cramps. I drink lots of water (2l a day??) I also salt generously. My upper left arm also has been twitching for days. I may also have kidneys that are not quite up to speed. Some kidney blood tests have shown me out of range over the last 10 years. But the doctor followed up and didn’t see a major problem. I did have severe IBS-D for all these years. Do you have any suggestions? Try making broth out of whole chicken or turkey parts and drink a few cups a day. See if that helps. I tried but I don’t know if I did it right. I just put the bones from one chicken in a pot and brought it to boil and then turned it down to minimum for an hour. It isn’t seeming to help. I have been taking about 12oz a day. My muscle twitching has gone from just my left arm to my left arm and right thigh. And it is pretty much around the clock. Well I don’t know if it is happening when I sleep. If you want the broth to be high in potassium, you need to use a whole chicken with all the meat or turkey parts with all the meat, not just bones. The potassium is in the meat. Then why not eat the meat? Does boiling it make it more easy to absorb? It gives you extra potassium in addition to the meat you are eating. You can only eat so much meat, but you can easily consume more potassium in the form of broth. It’s a natural supplement. I would like to try to increase my water consumption if I discover that I am below 2 L per day. Trying to do that with Dr. B. protocol, it sounds as though it is recommended that you add salt into the drinking water? Can anyone give any guidelines, about how much total salt intake per day and about how much salt is added to the drinking water? Or perhaps so long as the total salt consumption per day is in line with what he advises them no need to add it to the water? But from reading this thread it sounds as though there are some advantages of adding it to the water rather than incorporated into the diet or just adding salt under the tongue. I did order the book but hopefully it’s a simple answer. If i remember correctly, Dr. Batmanghelidj recommends 1/8-1/4 tsp of sea salt per quart of water.